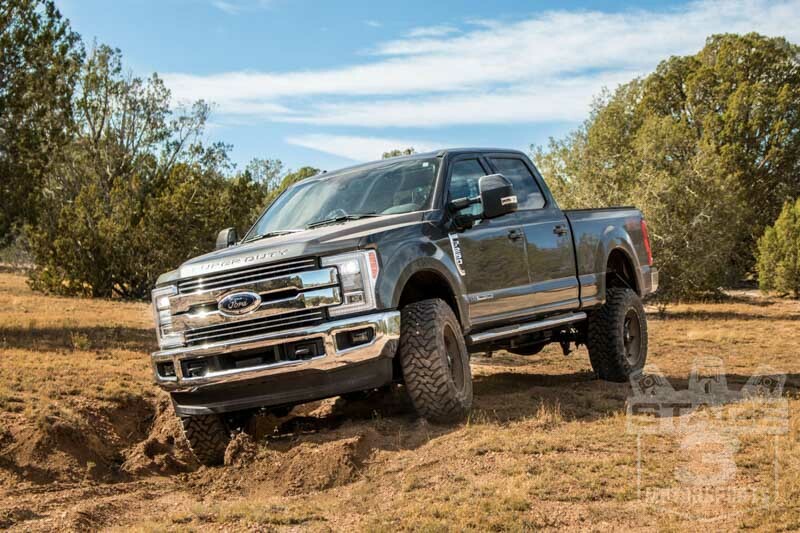 There are a lot of good reasons for wanting to level your 2017-2019 Super Duty in the front. Maybe you want to slap on some big off-road wheels, or maybe you just can't stand the "nosedive" look with the factory front-end rake. 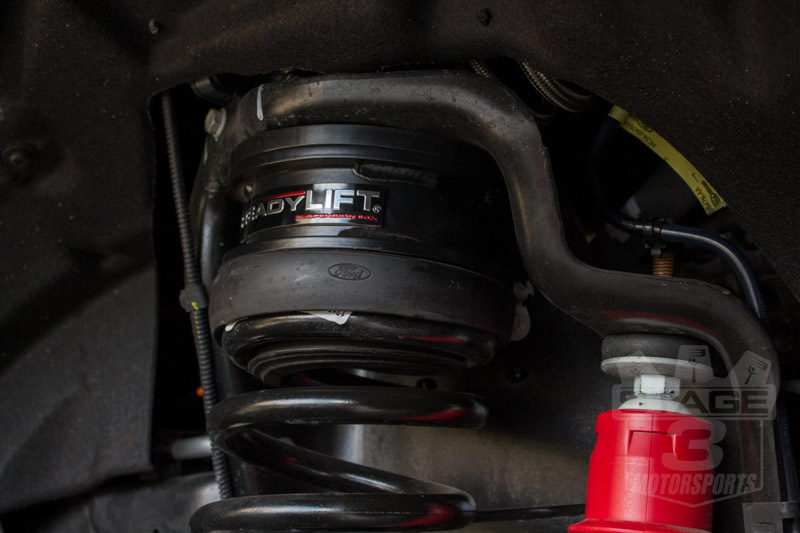 Either way, ReadyLIFT's 2.5" Front Leveling Kit is your tried-and-true alternative to a full-on suspension lift. 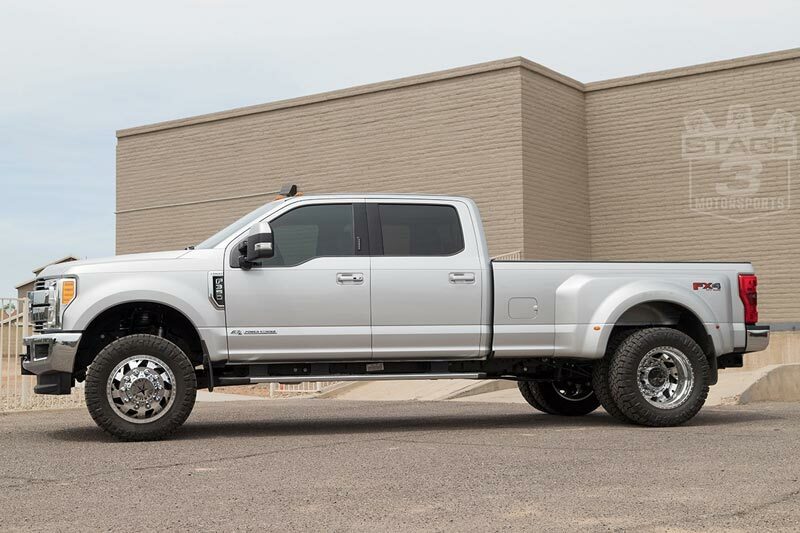 If you don't mind your OEM ride and simply want to level things out, why spend an arm and a leg for a full lift when you can get the same look from this high-quality spacer kit from ReadyLIFT? 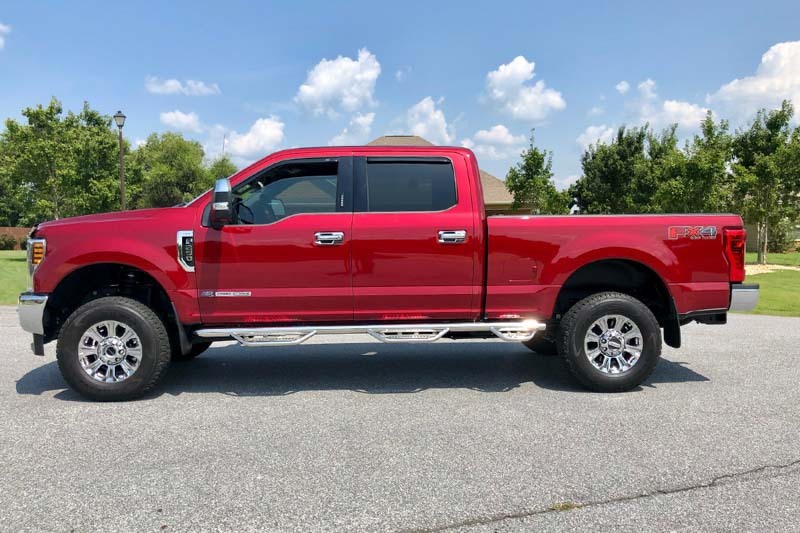 This complete leveling kit installs easily and is 100% guaranteed to maintain OEM ride, making this a no-brainer for accommodating bigger tires or leveling out rake. The good folks at ReadyLIFT designed this leveling kit for easy and complete installation. 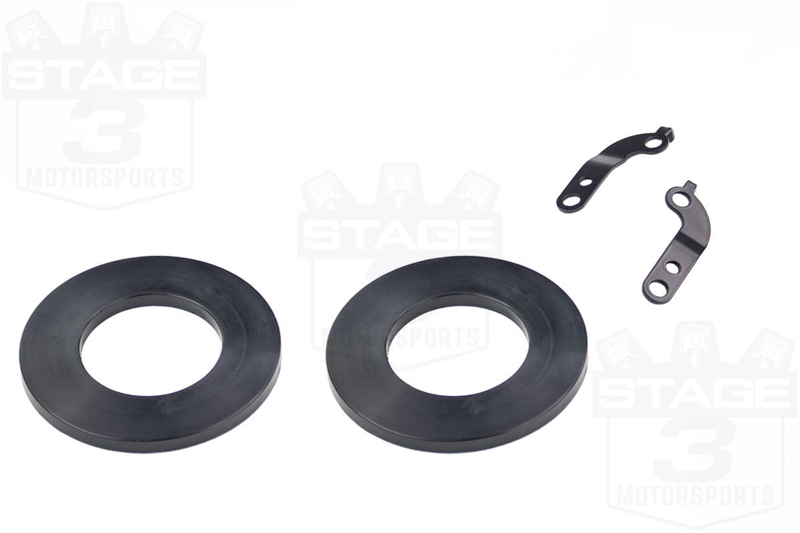 Included along with the coil spacers are sound isolators, shock extensions, bump stop extension, brake line relocation bracket, and sway bar drop brackets for proper installation of your new 2.5" front leveling kit. ReadyLIFT's Smart Suspension Technology is used to make installation of this kit easy and painless, and the whole process requires no cutting. 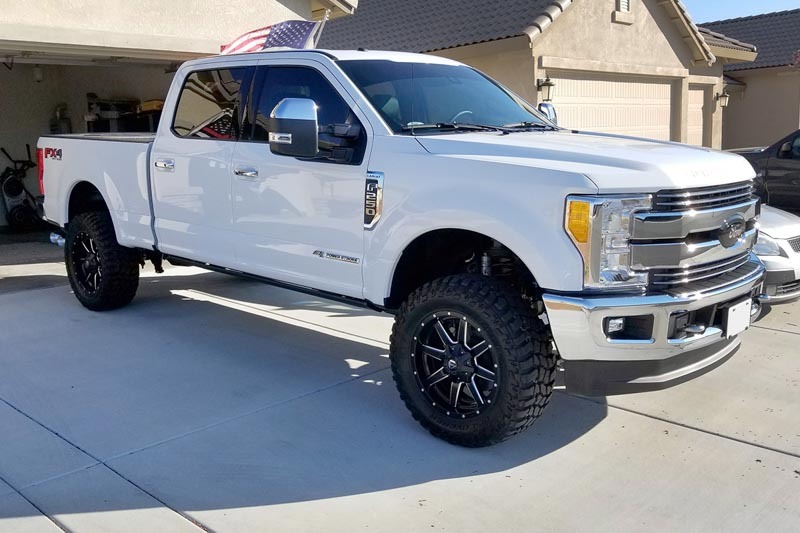 This high-quality leveling kit by ReadyLIFT is 100% guaranteed to maintain your truck's factory ride and includes a lifetime warranty against manufacturing defects. 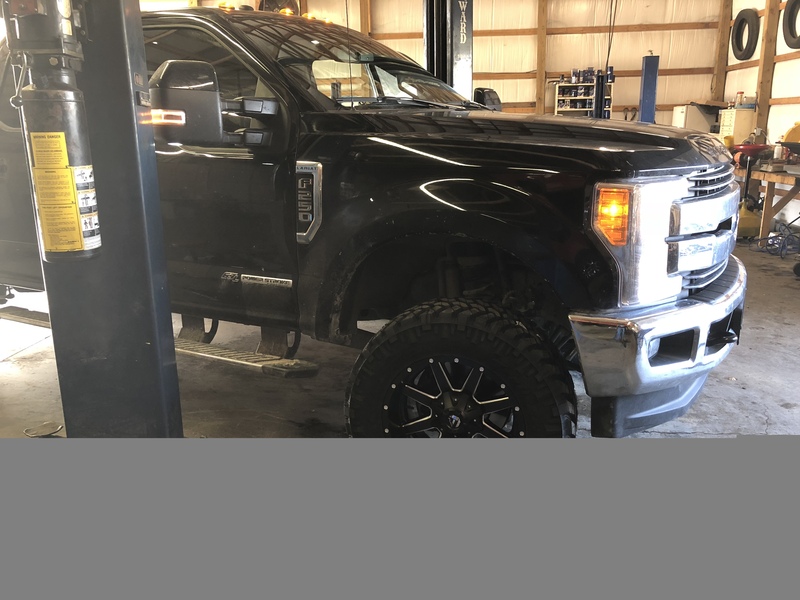 Wheel & Tire Fitment: You'll be able to comfortably fit 35" tires on your truck with this leveling kit installed. 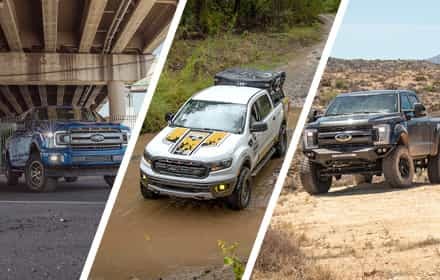 4WD Super Dutys Only: this kit was only designed to fit F250 and F350 models equipped with 4WD. 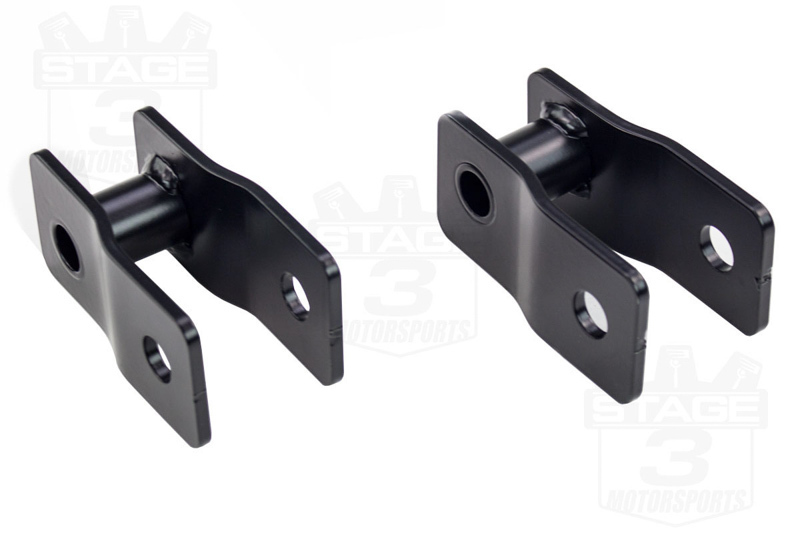 Track Bar Drop Bracket: this leveling kit tends to throw off front axle alignment by some extent. 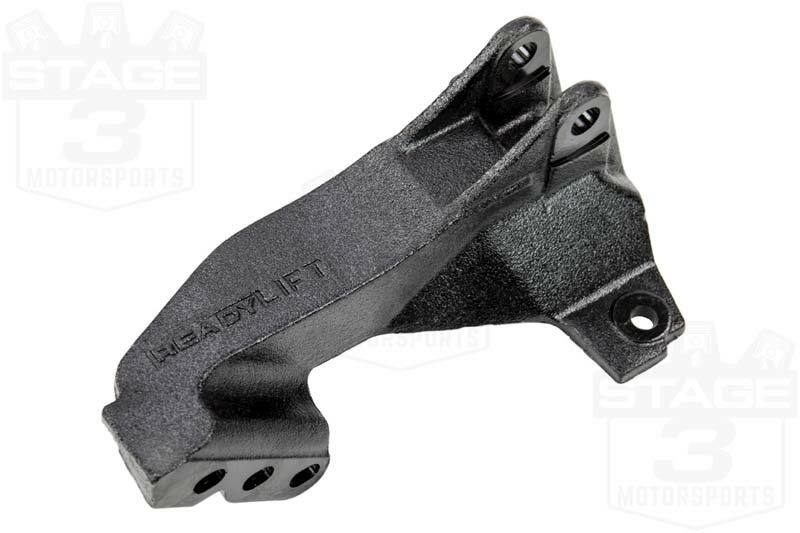 ReadyLift's Track Bar drop bracket can help remedy the issue for a cleaner, more even look for your truck. ReadyLift's Track Bar Drop Bracket can be selected from our drop-down menu above. Great kit. Steering wheel is off after installation and the driver side tire sticks out further than the passenger side. There needs to be a steering bracket added from Ready Lift. The truck did not need an alignment. The kit works great, but nowhere in the installation or ReadyLift's website does it mention a steering bracket may need to be added. We had to call Ready Lift to get this resolved. Excellent rating on the kit, but poor rating on ReadyLift's notification that additional work may need to be done. This lift was easy to install and only took a few hours in my garage with your standard jack and stands. Looks great, parts were all grear quality and instructions were pretty clear. The only recommendation that I make to everyone is to by the track bar bracket like I did. 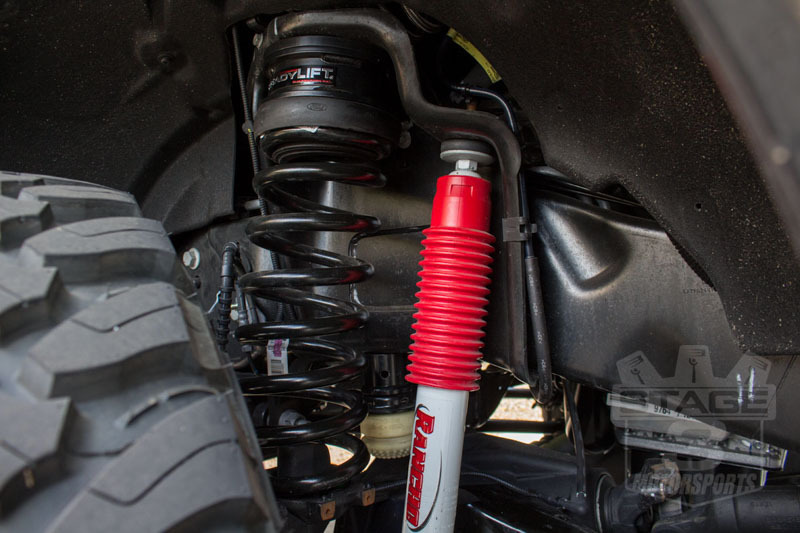 It's an added expense but a necessary one or your axle will be pushed to the driverside and your passenger side spring comes very close to rubbing on other parts like the bumpstop and part of the frame. Don't be cheap, spend the money and do it right. The bracket is very simple to install. Great kit easy to install . But it needs a track bar added it pushes the front axle to the left about 2 . 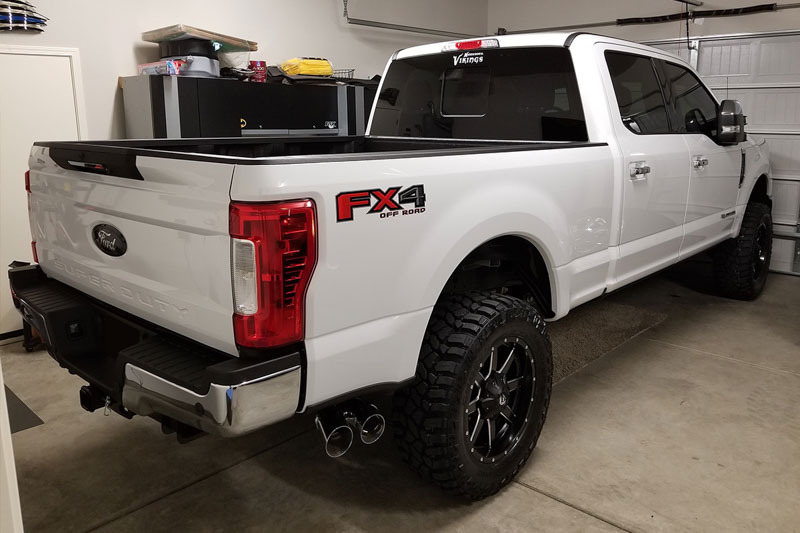 Installed on 2017 F250 4x4, looks great, install would have been easy if I had tall jack stands (2 or 4 even better) and a tall HD floor jack, if you do not have these items it is very dangerous to do the job yourself. I did get it on in a few hours without the proper tools, although I might have been smashed at any moment... I did leave the tires and wheels on for make-shift safety, I still had plenty of room to work behind and around them... overall great, recommend taking to a shop to install..
after looking at all the different options for front end leveling kits, I settled on this ReadyLIFT kit because of the extra parts that take the stress out of the front end components. Once the kit came in, I got to work in my garage and the process took about 3 hours. It would've gone faster but I lacked the equipment to jack the truck up high enough to remove the spring and add the spacer. I wound up going to Walmart, buying a cheap 4-ton jack, and placing it between the frame and the axle. Worked perfect to spread them apart enough to R&R the spring. I noticed my steering wheel was off center (though the steering didn't pull) so I had a $80 alignment done and that did the job. As promised, the truck is absolutely level now and rides very smooth. You'll need to invest in an alignment and have your headlights adjusted down. Other than that, this is a great kit for the money and the ride is super. By far the best leveling kit I've ever had put on, took about 1.5 hours and that including the allinement . Did not change the ride of the truck, if anything it made it better! And dam what a difference in the look, Its amazing how much a levling kit can change the looks of a truck.....no more rake.....great product!! Took about 2 Hrs to install, very easy to do with the right equipment. Great quality product highly recommend. Easy to install and works good and makes pick-up level. 2 hour install. 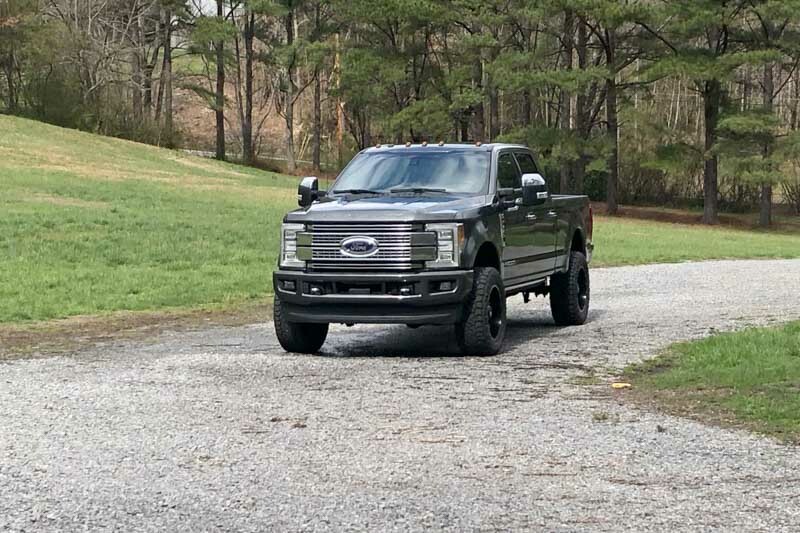 This is the best leveling kit I've ever purchased. With the track bar relocation bracket, this lift has everything. Extremely durable kit components and nothing more. Rear sat 3/4 higher than front after install. 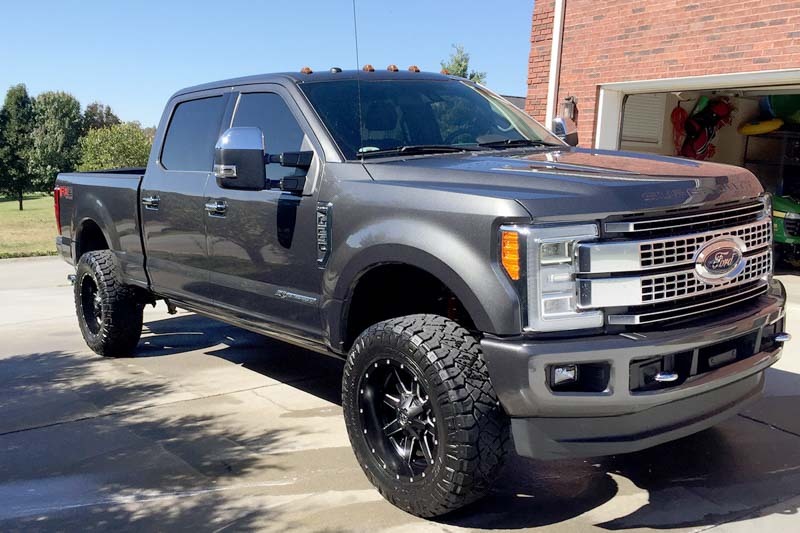 Have 35x12.50R18 Toyo Open Country A/T on factory rims with zero rubbing. Looks and drives great. Very good quality kit and kept the factory ride. 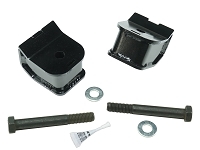 Nice Kit, solid equipment, easy to install with the proper tools and no fitment issues. There are good youtube videos on how to install, which helped. 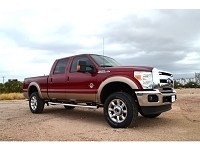 Levels the truck perfectly and still retains full factory ride quality. Leveling kit installed nicely, written instructions were easy to follow. Had to use 4 tall jack stands to make sure it was safe. 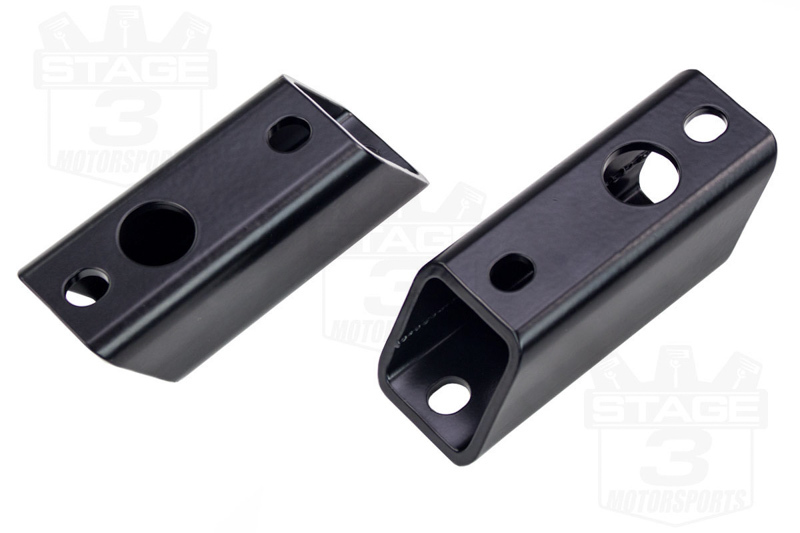 I chose to purchase the track bar drop bracket based in other reviews. I am glad that I did to keep everything evenly spaced, to prevent potential rubbing of parts with the axel shifting a couple of inches. Even though it is an additional cost it is worth it in my opinion. I had to get an alignment after the install. 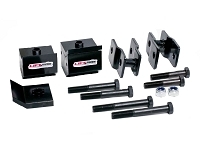 You will need the proper tool to apply up to 200 ft-lbs torque based on the instructions. Over all installation with 2 people took about 2 1/2 hours. I was a little skeptical about not enough or too much. This lift is dead on level. Time to install is 2 hrs with right tools and lift. 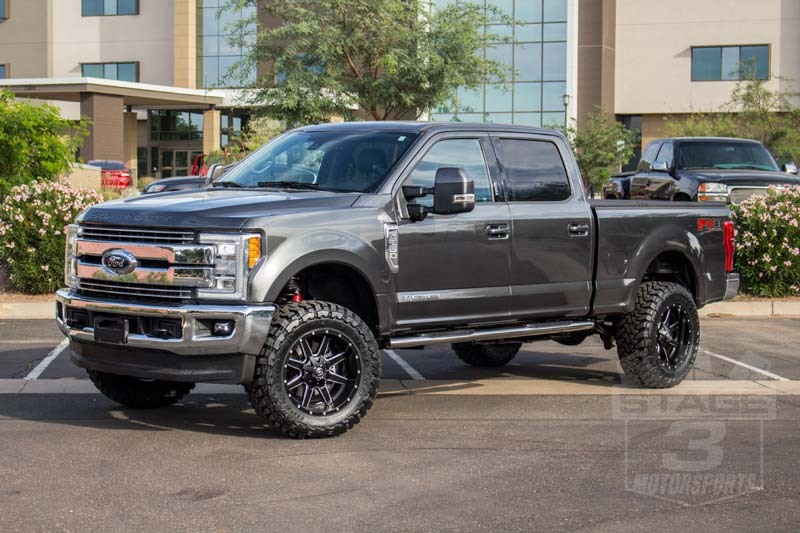 What is the wheel offset on the grey truck in the pictures? 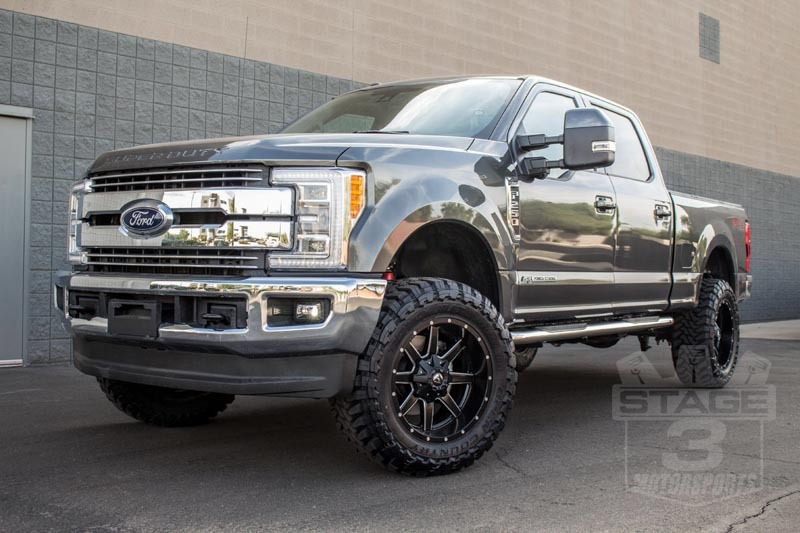 The wheels on our 2017 Super Duty Project are 20x10" Fuel Mavericks with a -12mm offset. Was this answer helpful? 16 of 18 Found Helpful. 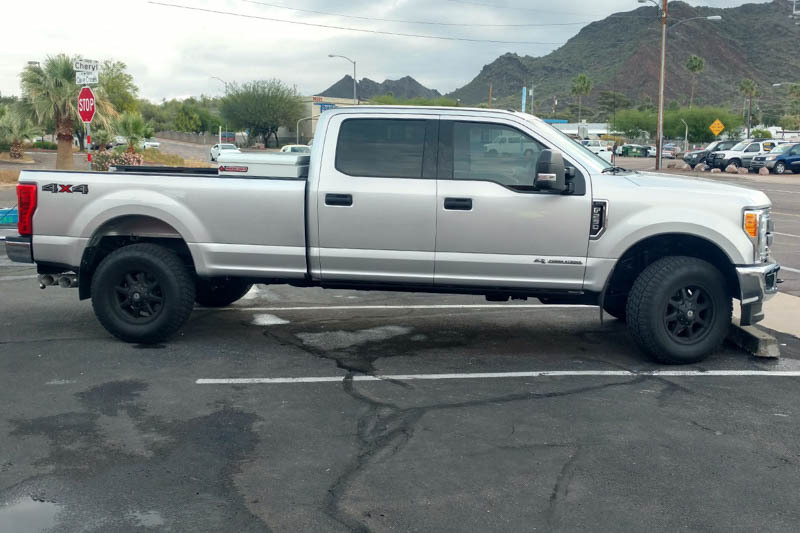 What size tires are on this truck and how much higher is the bed of the truck vs stock height? 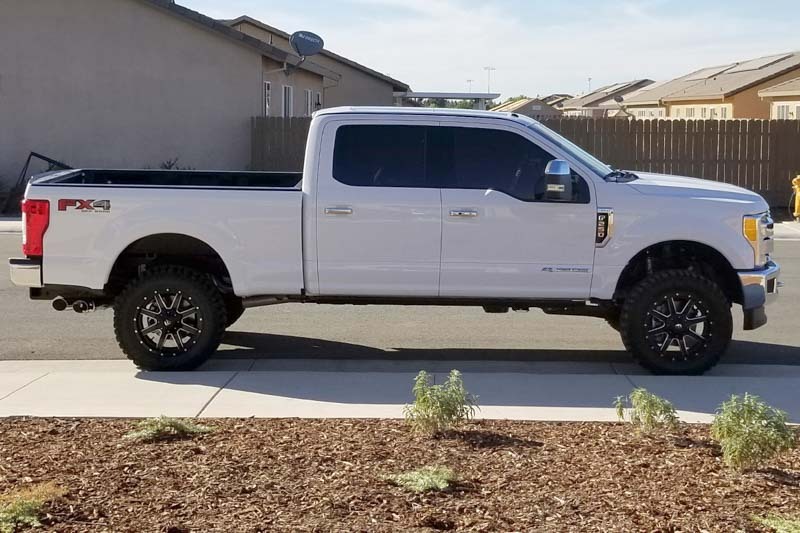 Our 2017 F250 6.7L Project truck currently has 35x12.50R20 Toyo Open Country M/Ts. Currently, that truck's rear end is at factory ride height. Will this kit level the truck completely or will it still have a slight forward rake to it? 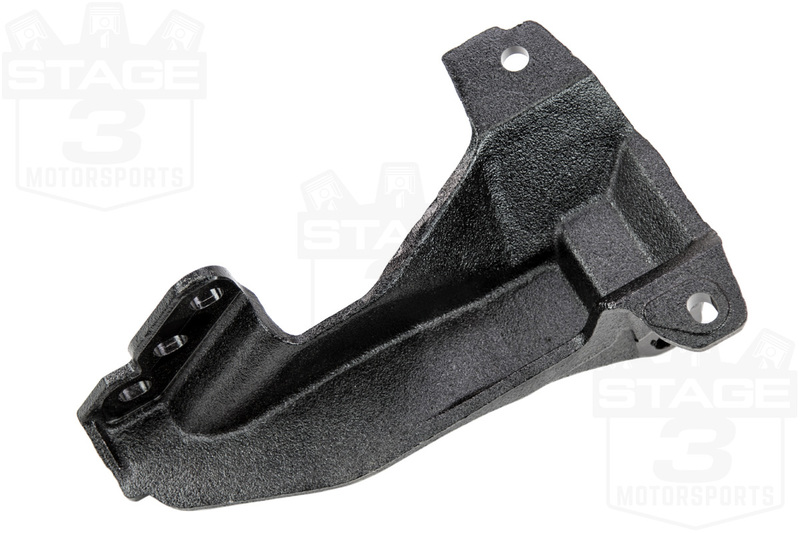 Also if I'm seeing it right this comes with the coil spacer, shock extension, bump stop extension, brake line extension bracket, and trac bar mount? Thanks for your reply. 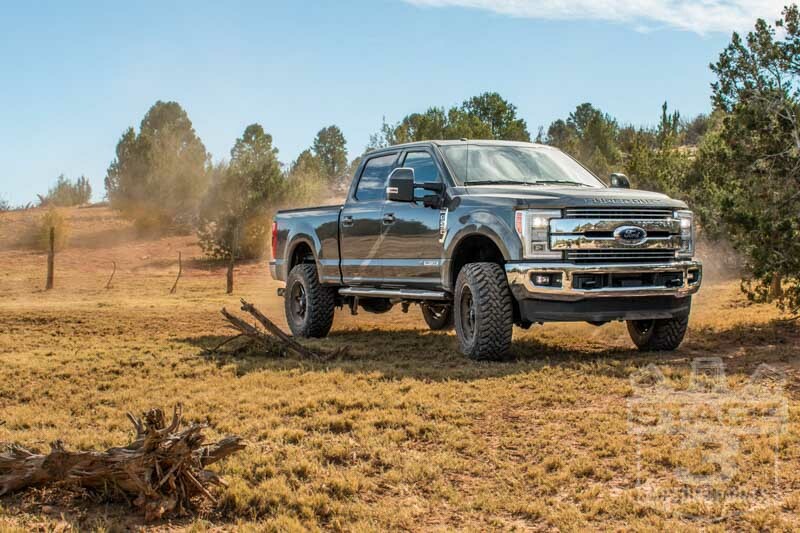 On our 2017 Super Duty, this kit provided pretty close to a dead-level stance. See this image for an example. 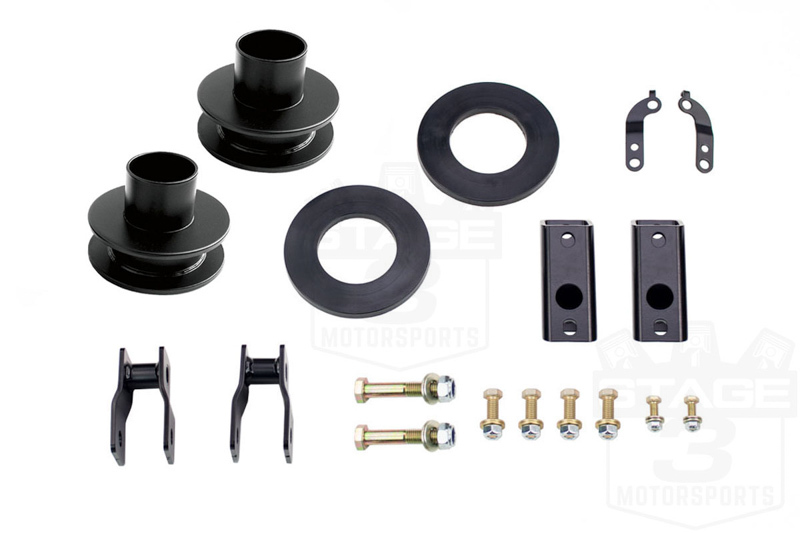 The kit comes with a coil spring spacer, shock extension, bump stop extension, brake line relocation bracket, and sway bar drop brackets. Was this answer helpful? 5 of 7 Found Helpful. 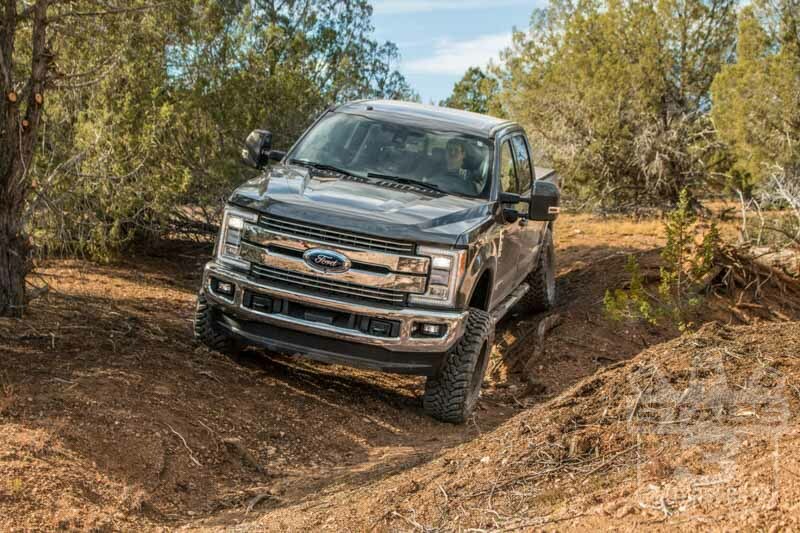 In general, 2.5" of leveling generally won't require an aftermarket or adjustable track bar, since the amount of lift isn't generally enough to throw off your overall axle positioning by a significant amount. That being said, you can add an adjustable track bar, if you want, though current options for the 2017 models are pretty limited. Any trimming needed for the toyo? any rubbing? 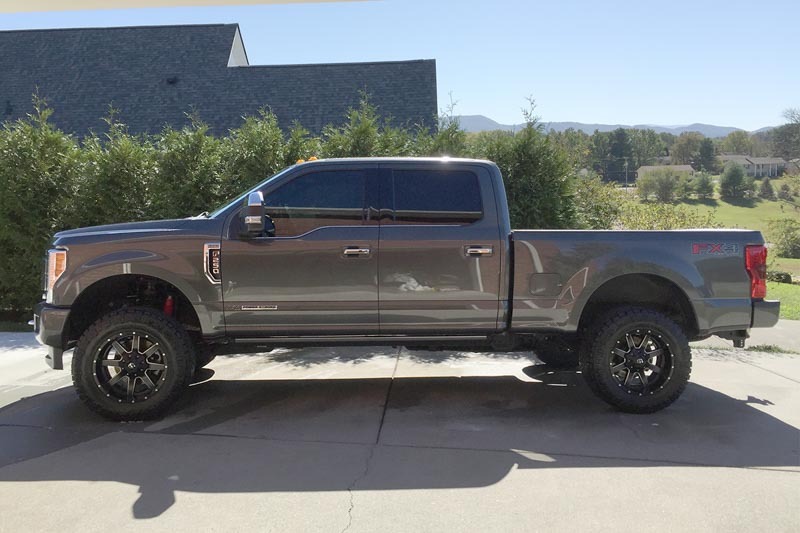 We did not require trimming for the 35x12.50" Toyo M/Ts on our Project Truck, and we don't get any rub during normal driving with them on our 20x10 Mavericks. The only time we've gotten rub is during off-roading, usually when the suspension fully articulates while turning. 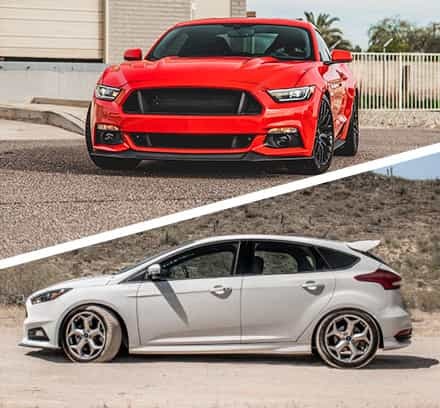 Will installing these same tires on the factory rims cause them to rub due to the offset being different? You would likely rub using a 12.50" wide tire on the stock wheels. While you still could go with 35" diameter tires, you'd probably be limited to an 11.50" wide tire if you wanted to avoid rubbing. Is this going to be ok for a gas motor? I know Diesels are heavier. Yep. 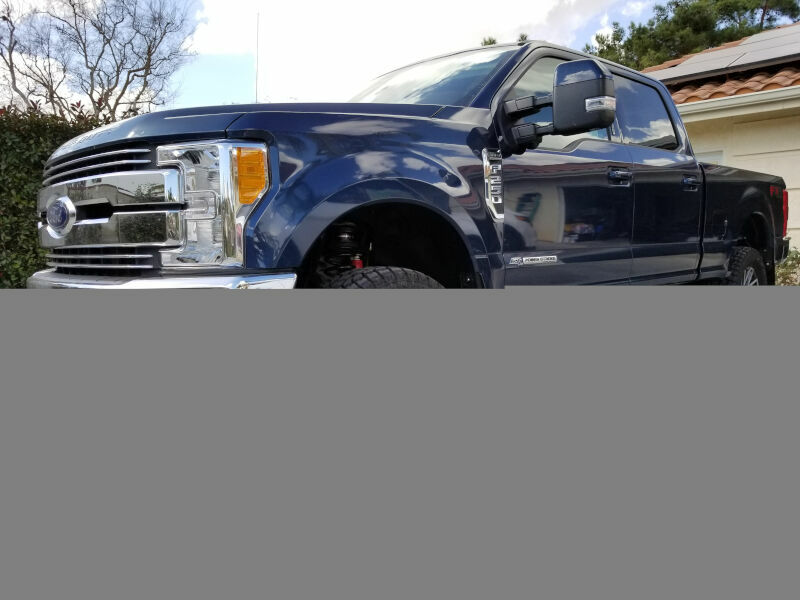 ReadyLift's kit fits both gas and diesel 2017 Super Dutys with 4WD. Will this kit affect towing? 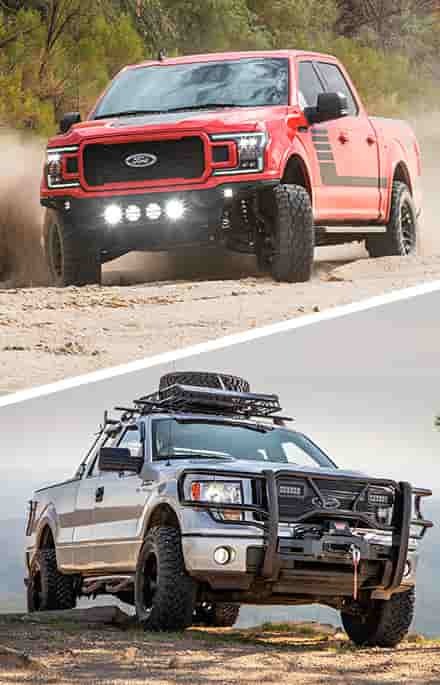 Neither the kit or its components will effect your truck's overall towing capacities. 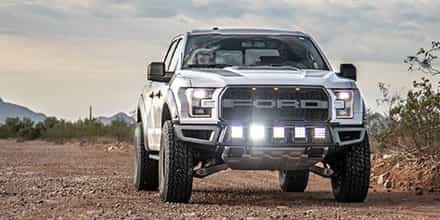 However, since this kit does get rid of most (if not all) of your truck's rear rake, heavy hauling or towing will likely cause a nose-high stance when towing which could lead to drivability issues. 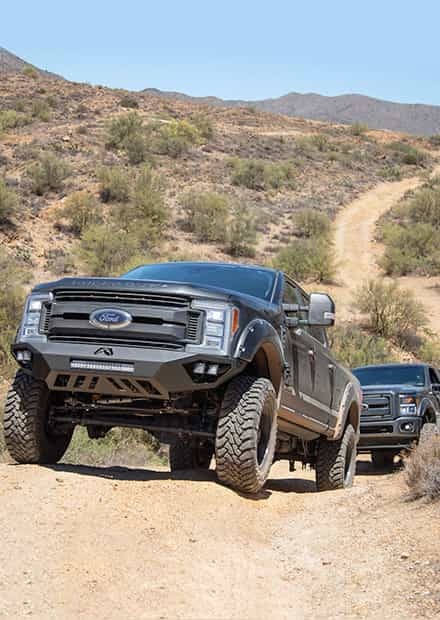 You may want to consider running air bags, additional rear lift, or other load-leveling system if you're towing heavy with this kit installed. Will this kit void my factory warranty ? 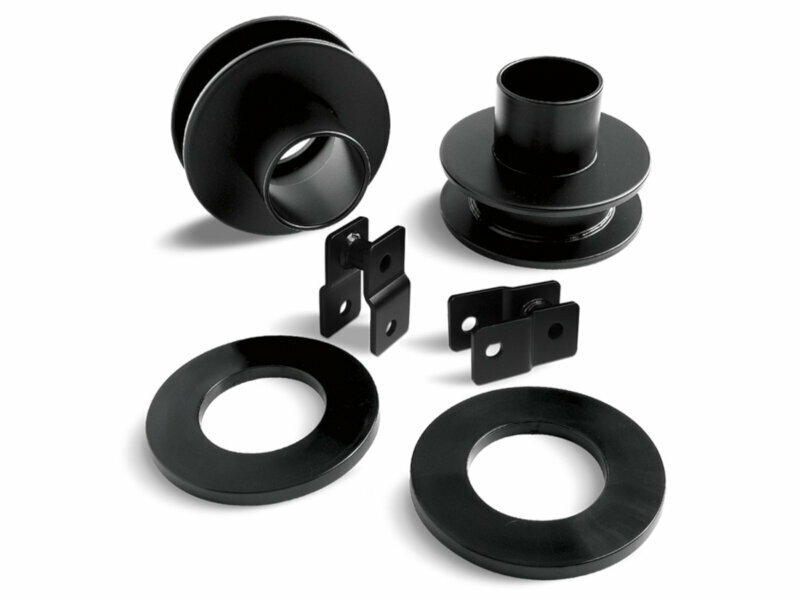 In general, a basic, bolt-on leveling kit like this won't have an effect on your truck's overall Powertrain or Bumper to Bumper warranties. 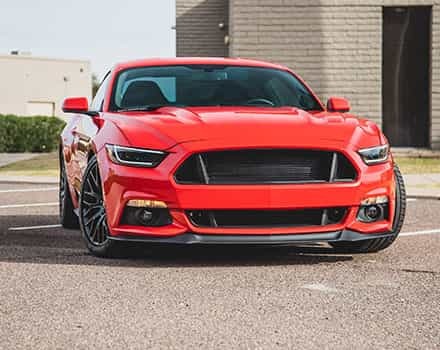 However, all warranty decisions are up to individual dealerships, and a dealer could potentially refuse to cover a given repair under the terms of your factory warranties if they believe the leveling kit or wheel and tire combination led to a given failure. Your best bet would be to talk to your Service Center directly and see what kind of leeway they give. 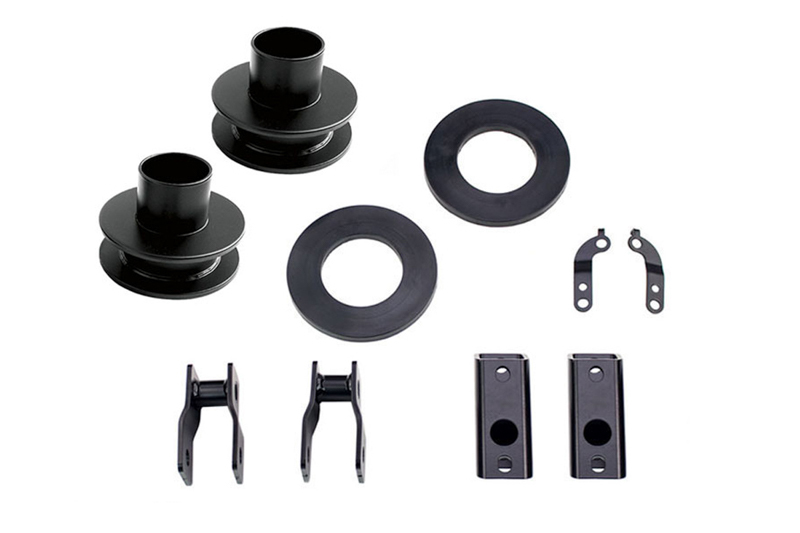 I have a plow on my truck that wouldnt allow for the sway bar extentions to be installed is it ok to install this kit without them? 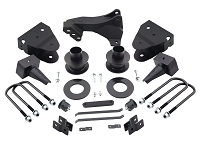 You technically could just ignore and not install the sway bar brackets, though you'd probably be better off doing something like the Pro Comp 2.5" Kit that doesn't include them to save some cash.